I did not move any of the modules from inside the main folder so it is installed as you zipped it up. It will also not allow me to turn in any quests. Hope to see this up and running smoothly soon. Last edited by : 09-13-08 at 07:48 AM. This is wonderful. I've been keeping my eye on this addon at wowace for a while, but it didn't have the data for Azeroth when I would download it. 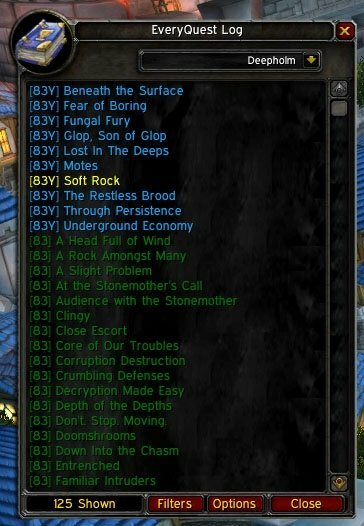 I'm absolutely ecstatic about Azeroth support finding it's way into EQ. Seems that there is no module for Eastern Kingdoms though. It's in the drop down menu to select Eastern Kingdoms and the zones within EK, but the module folder is missing from the download. AFter installation, I had no errors until I went to accept my very first quest. This was on a human priest in Loch Modan, at the farstrider position. I hope the following informtion helps. I also use the MazzleUI setup, so lots more addons in the folder besides what I have listed. Additionally I did not deactivate any of my addons to specifically just test yours. I extracted the folders from the modules, and copied them to the Addon's folder, but also left a copy of them in the modules folder to see if I got the same bug as Balsta. Last edited by LadySilverwolf : 09-13-08 at 09:39 AM. Thanks for the bug reports, I tried to debug it as much as possible, but I guess I missed some for when it is a brand new installation. Expect a new version this afternoon. Wow, that was silly of me! Commited this to SVN, will update wowi when ace packages it. In addition, the error from line 535 should be fixed, if you have any more trouble with this just let me know. 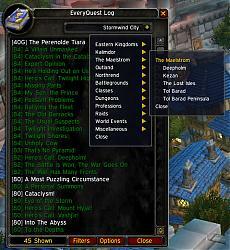 It stems from the problem where WoW's quest categories differ from WoWHead's categories. Example: I have 2 quests in my log for Auchindoun, but WowHead has those 2 quests under Sethekk halls making the addon think it doesn't have the data. When this happens it loads all the data it can and searches it since the quests are there. I have attempted to access EQ through the Quest window, and unfortuantely I was unable to actually click on the EQ button at the top of the quest window. I had thought it was the other quest mods I was using, but after some testing and tinkering, I have found it does not work with the Mod moveFrames. I don't see why it wouldn't work. All the EQ button is is a button attached to the QuestLogFrame. Do you have any error messages that I could see or does it silently fail? Unfortunately there was no error message. All I can say is when I attempted to click on the EQ button, it did absolutely nothing. When I removed the moveFrames Addon, it worked just fun. 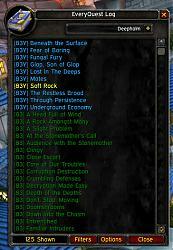 It is possible that it might also be related to DoubleWide, as I also use that addon for my questing. Hope this helps in t-sing... I wish I had a bug report to give, but it simply did not seem to 'exist'. Last edited by LadySilverwolf : 09-24-08 at 02:16 PM. I have tried running with just EQ loaded and tried with a fresh copy, but I get the same error every time. Expanding a zone category in the QuestLog also causes the error. Debug shows that all modules loaded correctly. Is this related, or is it another symptom of the same issue? Also, shift-clicking on a quest name to create a chat link doesn't seem to work. 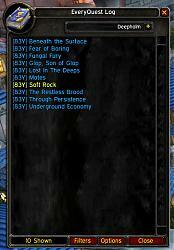 Oh, and when I click on the EQ button in the QuestLog, EveryQuest opens with a blank frame. 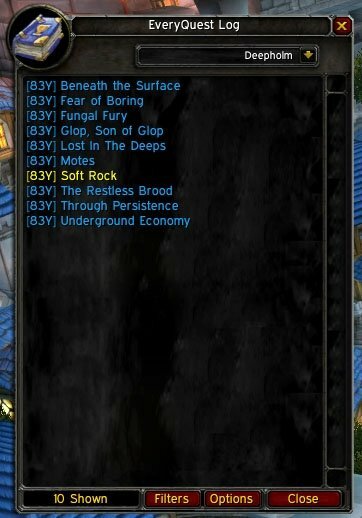 Should this be automatically selecting the zone I am in and listing the quests I am on? 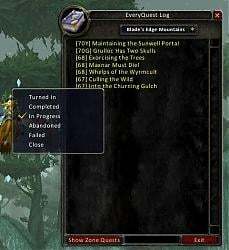 Just a thought: would it be possible to move the QuestLog frame when clicking the EQ button instead of when clicking on a quest title? Also, bEQL returns the the QuestLogFrame to standard width when EQ moves the frame on clicking a quest title. I assume this is bEQL's fault? Last edited by NocturnalEnigma : 10-07-08 at 04:34 PM. The above problems should be fixed in the file I just posted. (Release-5). If it continues let me know. Currently it will always open to a blank frame. I will look into adding an option to load the current zone (and by option I mean off by default). I'm not sure I understand this last part. Right now when you click a quest in the EQ frame I set the questlog frame to attach to the EQ frame and minimize if bEQL is installed and open LightHeaded if it is installed. 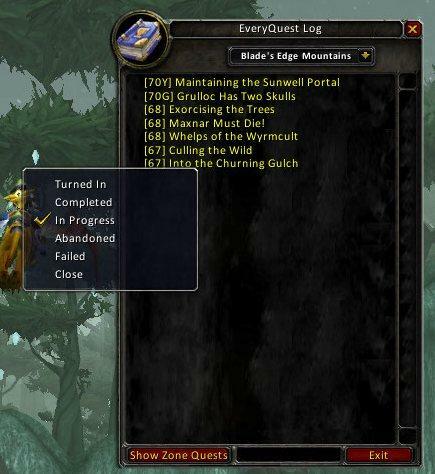 You would like options to position the EQ frame next to the Questlog frame when clicking the EQ button in the Quest Log? You don't want bEQL to minimize when clicking a quest in the EQ frame? The problems I have been having all went away with the latest version from here. 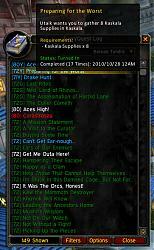 I was previously updating from WowAce. The only issue with EQ starting on a blank page is that I most often want to see a list of quests or my quest history for the zone I'm in. This means searching through the menu every time I start a new session or change zones. OK, so it's not hard to do that, but a checkbox that made EveryQuest "Track Current Zone" would allow someone to change zones and have the new list already waiting. The checkbox would automatically deselect when a new zone was chosen from the menu. Also, it would be nice if EQ remembered its state per character between sessions. In an ideal world. As for the last part, by default bEQL (and other similar addons, I guess) loads in the original QuestLog location at the far left of the screen and EQ opens directly on top of it. It would just be nice if EQ would shift the QuestLog window over like the default windows shift around automatically to prevent overlapping. I would prefer it if EQ did that when opened, but minimized bEQL and opened LightHeaded when a quest was selected. I have my interface scale fairly low so I can fit them all side-by-side, but they might take up too much space together for most people. Personally I would prefer to have an option to toggle both behaviours, but that's just me. 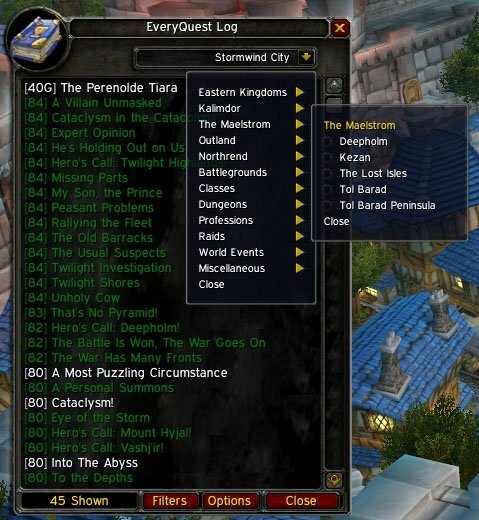 I'm not sure about this, but when a quest is selected in EQ that is *not* in the player's questlog, is it possible to deselect all quests in the questlog list and show a blank quest background in the quest information box? Also, if the quest *is* in the player's questlog, EQ selects it automatically when that quest is clicked on in EQ's list? I'm not sure how much control there is to make changes like that though. One last thing, LightHeaded doesn't seem to be opening automatically when a quest is clicked on in EQ. I keep LightHeaded open all the time though, so it doesn't bother me. Last edited by NocturnalEnigma : 10-12-08 at 09:36 AM. If you could create tickets on wowace for me that would be awesome. For the overlapping ticket, make sure to upload a screenshot of what it's doing since my setup is 1920x1200 and I don't have bEQL acting as a blizzard frame so it saves where it is. Using german client. worked before. Last edited by tareon : 11-04-08 at 02:15 AM. I sometimes have the same problem as tareon, using the english client. Most of the time it works, but sometimes when I accept or turnin a quest I get the not found error, and the quest doesn't update (even though it's in the list for the zone). Just hope Blizzard will make a UI call soon that can retrieve quest status based on quest ID... Backtracking all quests in Outland for the achievement is a pain! Anyway, I have a small problem at the moment. 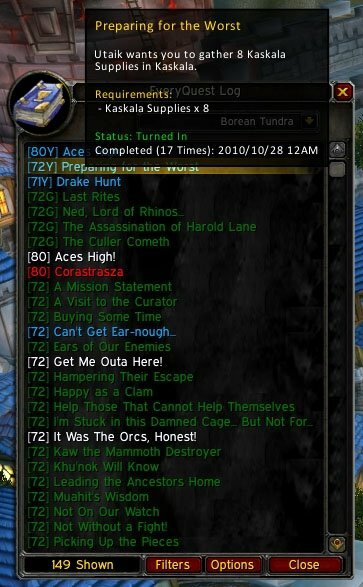 The quest list for Howling Fjord stops at " Of Keys and Cages", the rest of the quests are not displayed even if they are in the .lua file.